You are here: Home / HSA News / It’s Time for Pumpkin Pizzazz 2018! It’s Time for Pumpkin Pizzazz 2018! 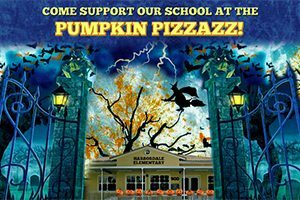 Students and families are invited to come out and support our school at our annual Pumpkin Pizzazz! This ever-popular event guarantees FUN for all students, siblings, and parents! The event will be held on Friday, October 12th from 5:00 – 8:00pm in the school parking lot. Wear your costume and come ready for fun! Volunteers are STILL NEEDED to make Pumpkin Pizzazz a success. There are still many volunteer slots available, from helping with car loop sales, manning tables at the event, helping with decorations, clean up, and more. Please see the Sign Up Sheet and help us make this the best Pumpkin Pizzazz in history! Can’t volunteer your time, but still want to help? Consider a monetary donation! Help offset the cost of food, entertainment, and supplies needed for this event. Donations to the HSA are accepted online… submit your donation now! Ticket Purchase Information – Updated Info! ALL tickets are available for purchase now through our online ticket form. Midway tickets, basket raffle tickets, and food tickets can all be purchased in advance – avoid lines at the event and spend more time having FUN! Midway tickets are $20 for a bundle of 40 tickets. Most midway games cost 1 ticket; game tickets are $.50 each. Some activities/events cost up to 5 tickets each, such as face painting and the dunk tank. Bake sale items and beverages will also be available for purchase with tickets. Basket raffle tickets are $20 for a bundle of 25 tickets. Each grade has a themed basket put together through donations by parents and staff – baskets are chock full of awesome stuff – be sure to check them out! Food tickets are $6 per meal – your choice of PDQ’s chicken and apples or Pie-Zan’s pizza and chips. Tickets purchased online can be picked up at the Will Call desk at Pumpkin Pizzazz. Please remember to put your name and phone number on your basket raffle tickets before dropping them in the raffle boxes, so we can contact you if you are not present at the time of drawing! Limited parking will be available at Southport Hardware (next to Quarterdeck) and in the vacant lot at 10th Avenue & 16th Street (east side of the school, across the street).